It’s a pretty thin plurality. 44%-37% isn’t exactly a tsunami of public opinion. As with most polls, this one doesn’t measure depth of feeling. 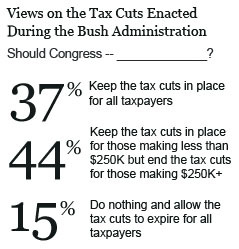 But here’s a guess: the 44% who want to end tax cuts for the rich don’t actually care all that much about it. Sure, it would be nice, but hey — did you see the Vikings last night? Favre looked terrible, didn’t he? As noted before, politicians don’t really care much what you think unless you’re rich. And it’s a pretty fair guess that nearly all the rich people in the country are in the 37% that wants to extend all the tax cuts. And they care about this a lot. In addition, of course, you have district-level dynamics that don’t show up in a national poll. If you’re campaigning in a district where 55% of the registered voters want to extend the tax cuts for everyone, then that’s probably the stand you’re going to take. The rest of the country really doesn’t matter to you. Oh — and did I forget venality and cowardice? Stir that into the mix too. Never forget venality and cowardice.